There is a growing interest in the pivotal role of exosomes in cancer and in their use as biomarkers. However, despite the importance of the microenvironment for cancer initiation and progression, monolayer cultures of tumor cells still represent the main in vitro source of exosomes. As a result, their environmental regulation remains largely unknown. Here, Columbia University researchers report a three-dimensional tumor model for studying exosomes, using Ewing’s sarcoma type 1 as a clinically relevant example. 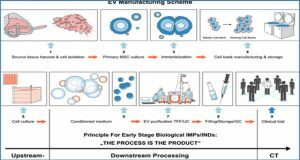 The bioengineered model was designed based on the hypothesis that the 3-dimensionality, composition and stiffness of the tumor matrix are the critical determinants of the size and cargo of exosomes released by the cancer cells. The researchers analyzed the effects of the tumor microenvironment on exosomes, and the effects of exosomes on the non-cancer cells from the bone niche. 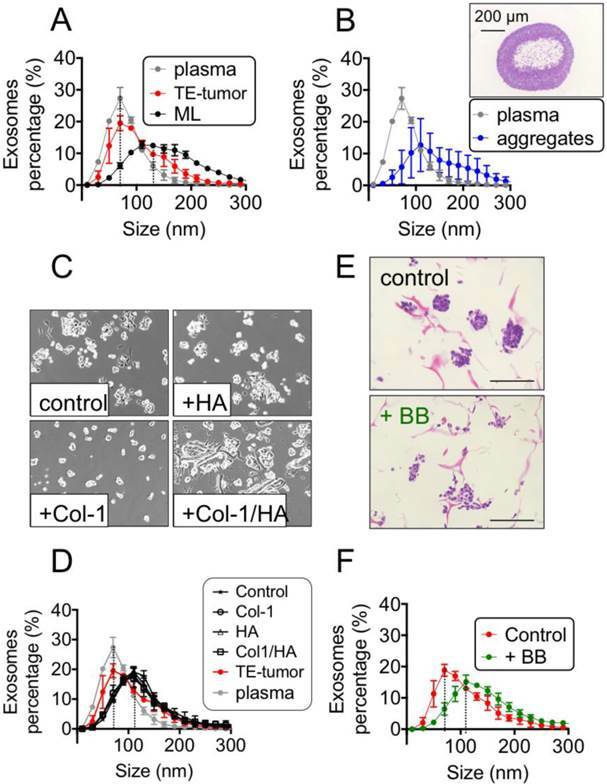 Exosomes from the tissue-engineered tumor had similar size distribution as those in the patients’ plasma, and were markedly smaller than those in monolayer cultures. Bioengineered tumors and the patients’ plasma contained high levels of the Polycomb histone methyltransferase EZH2 mRNA relatively to their monolayer counterparts. Notably, EZH2 mRNA, a potential tumor biomarker detectable in blood plasma, could be transferred to the surrounding mesenchymal stem cells. This study provides the first evidence that an in vitro culture environment can recapitulate some properties of tumor exosomes. (A) Exosome size analysis for SK-N-MC cells cultured in monolayers (n=3) and into Col1-HA scaffolds (n=6) at day 3 (ML d3 and SF d3, respectively), compared to the plasma from Ewing’s sarcoma patients (n=7), by Nanoparticle Tracking Analysis (NTA, Nanosight instruments). (B) Distribution of exosome sizes in plasma of Ewing’s sarcoma patients (n=7) and cell aggregates generated in polypropylene environment at day 7 (n=7), by Nanoparticle Tracking Analysis. Inset: Hematoxylin and Eosin staining of a representative SK-N-MC cell aggregate in polypropylene context, with a necrotic core, at day 7. (C) Bright field images of SK-N-MC cells cultured for 3 days in monolayers, on plates coated with Hyaluronic acid (+HA), Collagen 1 (+ Col-1), and Collagen 1-Hyaluronic acid (+Col1/HA). Representative images are shown (n=3 per condition). (D) Exosome size distribution for SK-N-MC cells cultured in monolayers HA-coated (n=3), Col-1-coated (n=3) and Col1-HA-coated (n=3) compared to SK-M-C cells cultured on uncoated culture plates (control; n=3) (E) Analysis of the effect of blebbistatin on cell aggregates in Col1-HA scaffolds (Hematoxylin and Eosin staining), and (F) on exosome’s size, by NTA; (n=3 per condition).